Advent is a time of waiting conversion and hope lived in the expectation that Christ will fulfil his promise to come again. Weeks one to three focus on Christ’s second coming. Week 4 prepares us for the celebration of Christ’s first coming commemorated at Christmas. Advent focuses us on the joys that await us. 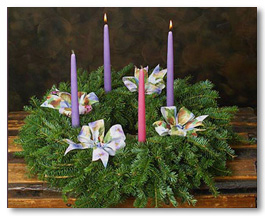 In our Parish, we mark the first Sunday of Advent with the lighting of the first candle on the Advent wreath. We place the symbols on the Jesse tree. Isaiah 11:1. We mark the beginning of the new Christian year with our Christian neighbours at the “Christingle” celebration. We prepare the children and explain the significance of the events through a special liturgy for children, which is part of the 10.30 Sunday mass. The readings and the music help us to prepare. We suspend praying the Gloria to create an air of anticipation for the night on which it was first sung by the Angels.